COMMENT: Mr. Armstrong I am currently based in Oklahoma City OK and recently received a citation from the District Attorney’s office, Oklahoma Uninsured Vehicle Enforcement Diversion Program, after a photo of my vehicle’s license plate was snapped while driving on a turnpike thoroughfare. The citation accused me of driving without insurance and attached a hefty fine to be paid within 30 days under threat of additional fines and prison time. Regardless of culpability, the onus is placed on the accused person to defend himself against what I assume are blanket citations issued to all drivers using this turnpike road, as I was fully insured on the date this citation was issued. Failure to respond alone ensures the state receives a minimum of $250. It leaves me wondering if Oklahoma is now practicing Minority Report style pre-crime procedures to increase revenues for the state. I follow your blog closely and remember you addressing similar practices by other states/municipalities, but generally in the form of asinine taxation. Mine is a less extreme example, but I find it disturbing that we now live in a world where one can be accused of anything leaving the burden of proof on him alone to avoid penalty. It didn’t take the insurance companies much lobbying to get the state to agree to this scheme. Both sides are making a fortune. I appreciate your perspective on these issues and thank you for enlightening your readers by addressing them publicly. REPLY: I am not a fan of Insurance Companies. It is a crime to lie to them, but it is expected when they lie to you. I have NEVER had an insurance company ever pay what they claimed – NEVER. It is the biggest fraud in American history and they line the pockets of politicians to create such laws that are always one-sided to their benefit. States are dead broke. This is part of the collapse of government and socialism. Nobody will simply look beyond next week and see that they will constantly be raising taxes to try to keep their corrupt system afloat. You have a better chance of winning the Lottery than winning any tax case against a government in court. Of course, then they will take their pound of taxes out of your winnings any way and then try to pay you out if they can over time making use of the Lottery money to its fullest. I was given a parking ticket in New Jersey in a private parking lot for being over the space’s white line because the first guy parked crazily forcing everyone else to be over the lines as well, This was in front of Starbucks. Now the ticket was $25. Of course, it was illegal. But they also know you will not take a day off to go argue the legality. So the cost of paying $25 compared to them then suspending your license and racking up thousands in fines to keep driving and probably jail time ensures they know you will pay illegal fines. As a collective society, we are passive-aggressive which denotes a type of behavior/personality that is characterized by indirect resistance to the demands of others and an avoidance of direct confrontation, as in procrastinating or pouting. 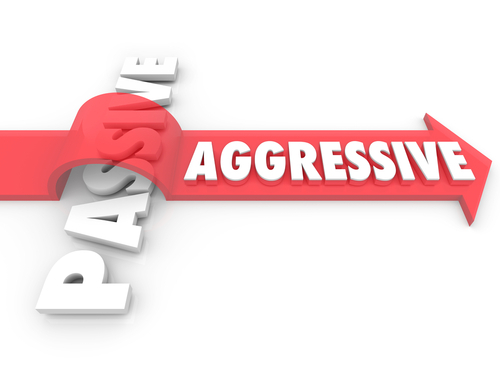 The Passive Aggressive Conflict Cycle explains how rational, straightforward, assertive adults can momentarily and unexpectedly depart from their typical personas and erupt. There is some fine line somewhere that when crossed, society will no longer take the corruption and abuse of government. That is when civil unrest rises and this can lead to revolution. Certainly, revolution is NOT possible without their first appearing civil unrest. This is what we have been witnessing in France. It was Thomas Paine’s Common Sense that lit that fire of Passive-Aggressiveness within the American Colonists. Once his writing appeared, the people were inspired and demanded freedom. We are headed down this road and you can smell it in the air. The hatred building between Democrats and Republicans centered around Trump is incredible. Put on one of his red hats and you will be verbally abused within hours. It has become fashionable to attack Trump supporters. One person wrote in to say in South Carolina, a person’s car was shot up in a parking lot because they had a Trump sticker on it. This time around, politicians have succeeded in dividing the people and turning them against each other. That is what makes this particular cycle so lethal. 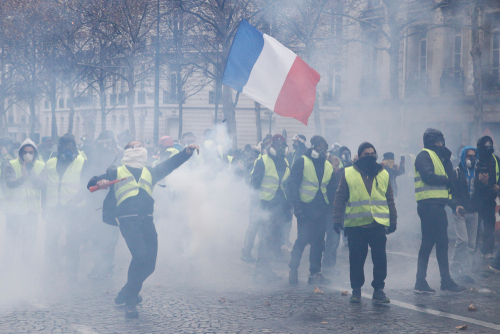 Normally, it unfolds as in France, the people against the government. What is Macron doing in response? Blaming the rich and vows to go after them. Of course, even if you confiscate all the assets of the rich, it will NEVER be sufficient to sustain the government. So at some point, the entire system just implodes into Revolution. What Oklahoma is doing is the early stages of this massive hunt for taxes, fines, and penalties. Since government was once supported by lower taxes, their aggressiveness demonstrates their inability to manage society. They keep consuming a greater and greater proportion of the national wealth until the destroy our standard of living. They will not look at the trend for they are desperate to survive. This is why we must wait for the crash and burn. It becomes inevitable.